Look for a hidden treasure across the river from Marietta, Ohio along the banks of the Ohio River. Here a Victorian plantation mansion from nearly two hundred years ago seems to watch over the river between Williamstown and Parkersburg, WV. 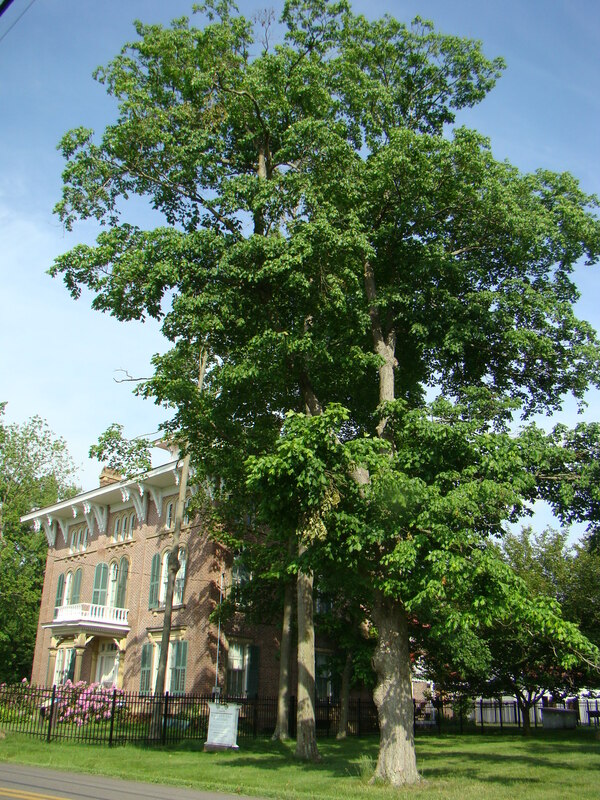 Even before Henderson Hall came into being, the Henderson family played a vital role in the Ohio River Valley. Vice-President Aaron Burr and Harman Blennerhassett thought that perhaps the Henderson brothers would help in their attempt to set up a separate nation west of the Alleghenies. Hendersons would not be coerced, called their father’s friend President Thomas Jefferson, and testified in the Burr-Blennerhassett trail in 1807. Henderson Hall was built shortly thereafter in 1835 by George Washington Henderson and Elizabeth Ann Tomlinson Henderson, grand-daughter of original claimant of Williamstown. This merger of estates encompassed 2600 acres on the eastern bank of the Ohio River. It seemed that everything they touched turned to gold, from the land they purchased, to breeding fine horses, to owners of an oil field boom. Walking to the house, one of the three Indian mounds on the property is clearly visible. 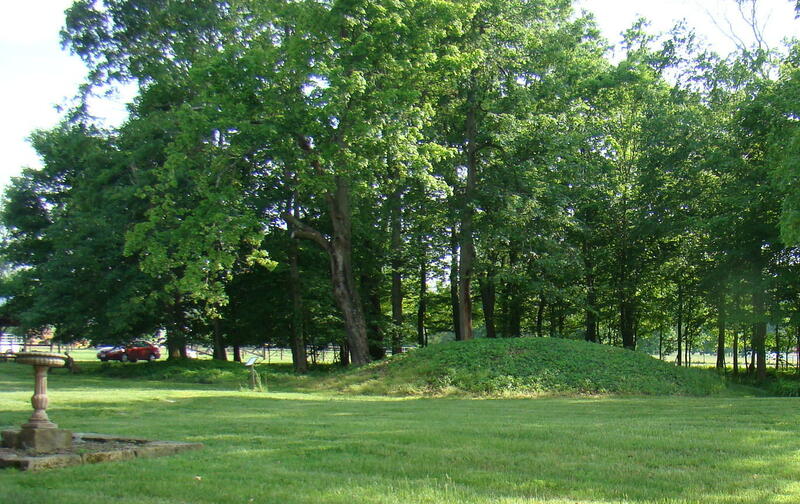 Dating back 2,000 years, Adena mounds appear in several places in the Ohio Valley. Inside the mounds were found skeletal remains and artifacts. Even though the Henderson family supported the efforts of the Union during the Civil War, they did themselves keep thirty slaves. Some of those slaves actually left through the Underground Railroad, which the Henderson family supported, in Marietta, Ohio. This well preserved Victorian plantation propels visitors into the past with twenty-nine rooms to explore. All the rooms overflow with memorabilia from the 18th century to the present. It seems the Hendersons kept everything. 250 years of letters and diaries were found in the home – what treasures! Even more impressive is the trail of famous historic figures, who visited frequently. In the front parlor with its gold leaf wallpaper, pictures of Elizabeth and George hang over the mantle of the fireplace. In the picture she wore a hair broach, which was considered mourning jewelry. Having twelve children during their lifetime, six of them died before the age of ten. Elizabeth took a lock of hair from each of those six children to weave into an intricate pattern for her broach, which she always wore. The broach remains on display today in their small museum. Collections from these 19th century hoarders give visitors a chance to see the changes made in many areas of life. The overwhelming amount of treasures saved, ranges from toys to wedding gowns to beautiful dining room settings. A winding staircase curves up to the third floor ballroom, making the mind wonder how those ladies managed these steep stairs in their flowing gowns. 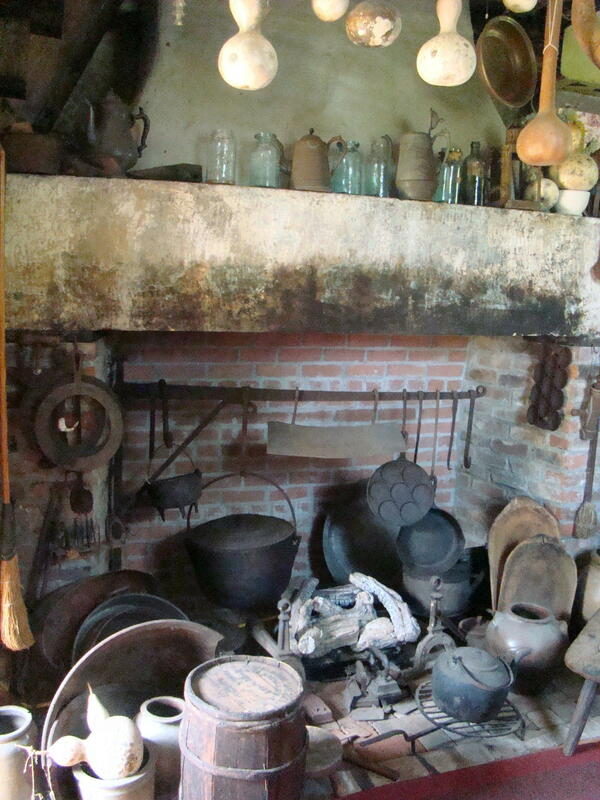 The 1836 kitchen holds household cooking utensils and crockery dating back a couple centuries. This was part of the original smaller house before the 1859 impressive addition. Many of the rusted kitchen utensils can be found stored in the basement today. 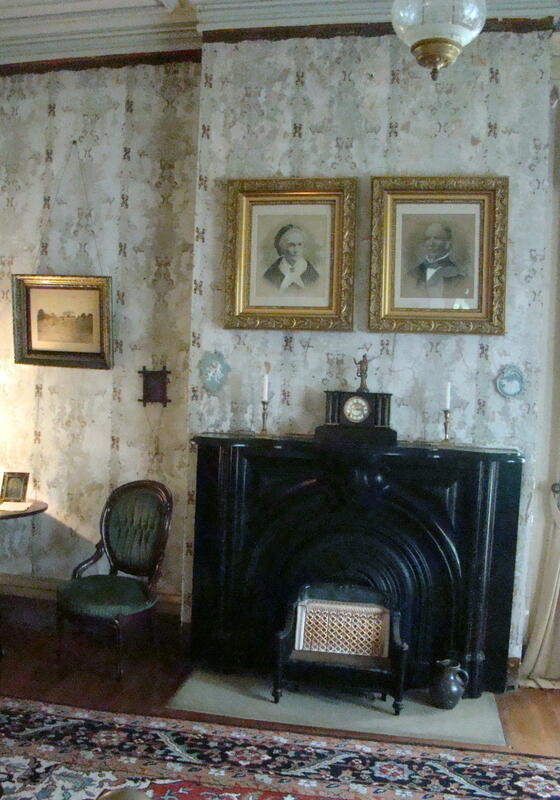 When the last family member died in 2007, the historic house was deeded to the Board of West Virginia Oil & Gas Museum. Today they keep the place in repair and have great guides to share the Henderson story. The earliest school in the area was here behind Henderson Hall in 1836. Note the teacher’s desk with candle and switch – for pointing and for correcting. Several old books from that time period have been placed on the students’ desk along with slates to practice writing and mathematics. 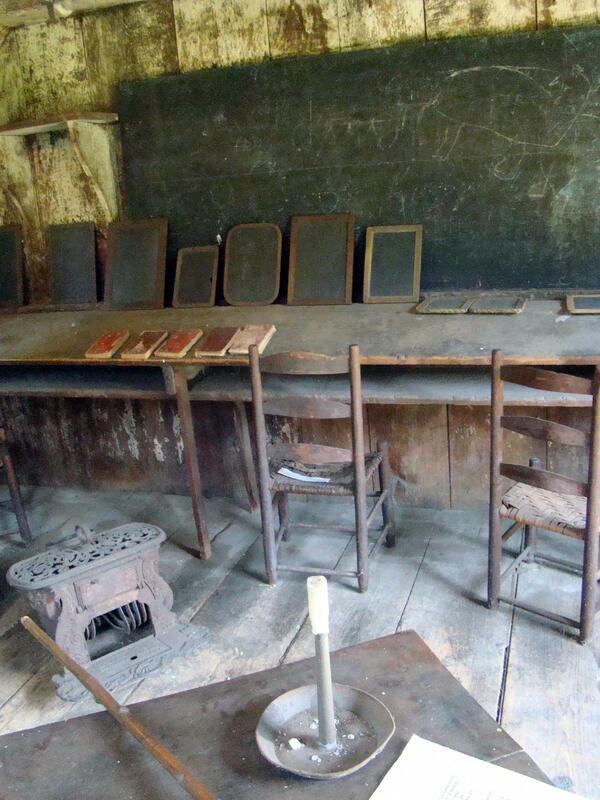 Original equipment includes: slates, blackboards, and seats. What a thrill to gently touch the slates, which were used by youngsters from the 1800’s. The Carriage House contains different buggies. Among them is the actual buggy used by the original founders, George and Elizabeth, on their honeymoon to Niagara Falls. Henderson Hall overflows with treasures too numerous to mention. Hopefully you have now received a taste of history that will whet your appetite for more. Johnny Chapman, John James Audubon, and Stephen Foster always enjoyed their visits here. Shouldn’t you? Henderson Hall Plantation is just a few miles off I-77 at the Williamstown, WV exit. Follow Route 14 South, then turn right on Old River Road. Summer hours are noon- 5 p.m. daily.